Early in my helping career, I succumbed to the idea that the process of individual recovery had a beginning, a middle, and an end goal. I believed the process was linear. This process, I thought, involved the building of insight and awareness, internalizing this newfound awareness to self, then generalizing it to others and our surroundings. In my early days, I wanted to share this linear view and make it clear to those I meant to help. Such thinking, of course, led me to create my agenda for the client, which led to my disappointment when their outcomes did not match my linear thinking. After a few such instances, I began to explore this problem with my mentors. Through experience and self-reflection, I’ve learned that progress for our clients is almost never linear nor is it easily discernible. Like most journeys, progress is often a series of stop-and-start, disjointed, and pitfall-riddled processes. If we view our favorite tree from a distance, we may see a beautiful, almost symmetrical and well-defined image. As we come closer, we will often see a trunk that has been buffeted by the wind, scarred by humans or other animals carving or cutting into the bark. We may see branches growing in different directions. These branches are often gnarled and knotted, never straight. Looking closer still, we may see places where mini-branches have been pruned by someone or have fallen off naturally, perhaps pruned by the wind. The leaves themselves are likely imperfect, with scars and wrinkles and holes left from consumption by animals or the forces of nature. This is not dissimilar to our own journeys, and it most assuredly does not diminish, but enhances the overall beauty of our recovery. Recently, as I presented the Exploring Trauma – A Brief Intervention for Men workshop, a participant reminded me of an old Japanese legend regarding shogun Yoshimasa. As the legend goes, Yoshimasa possessed a favorite tea bowl and was distressed when he dropped it and it broke. He had it sent to China for repair and was disappointed when it came back because it had been put back together with staple-like pieces of metal. He commanded his craftsmen to come up with a repair more pleasing to his eye. The craftsmen returned his bowl and he was surprised and delighted to see that they had joined together the broken pieces with gold. This process, depicted in the image above, was called Kintsugi. 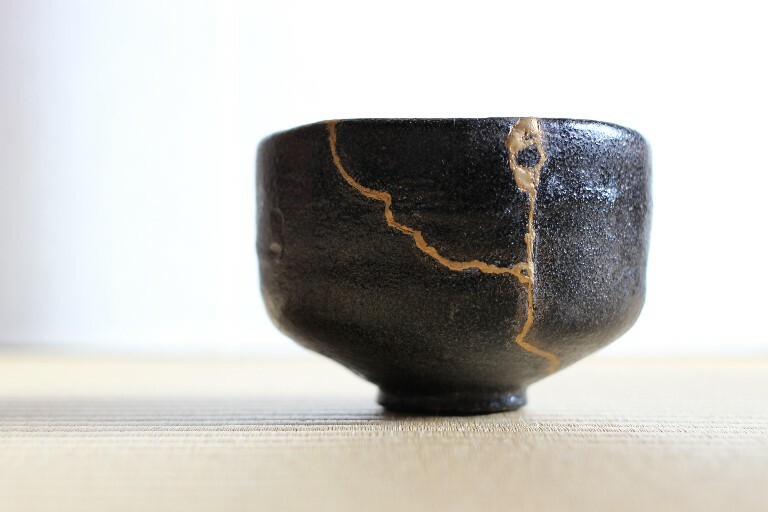 Kintsugi influenced a growing philosophical view in Japan, including the philosophy of wabi-sabi, which calls for seeing beauty in the flawed or imperfect. The repair method was also born from the Japanese feeling of mottainai, which expresses regret when something is wasted, as well as mushin, the acceptance of change. As I continue to evolve as a helper, this legend helps me to view my practice and, most importantly, my clients differently, though I may at times still struggle. No client should be given up as hopeless or wasted. Their recovery from present difficulties may not be what I envision for them. But if I am attentive and accept their journey as their own, I may be rewarded with a view made more beautiful by the gold-filled cracks my clients have put together through their growth on their journey. Feel as if you’re going around in circles with your recovery journey? We can help. Schedule a consultation or email us at info@frre.net.